Starter Kit Pen Giveaway – Pens! Paper! Pencils! Thanks to some very generous pen retailers, who send me many pens to review, I have ended up with more pens than I can ever use. Many of these pens are good but I know that if they stay with me they’ll spend most of their time in a drawer, feeling lonely and neglected, when they ought to be in a kind and loving home getting lots of use. With this in mind, I’m giving away a great little starter kit. These are all good basic pens that won’t let anyone down. The links go to my reviews of them. The Dex pens were given to me by The Pen Shop and the Manuscript pen was given to me by Cult Pens. The tin of cartridges was part of April’s Spotlight Stationery’s box. Total value is a little over £50. All you need to do to enter is leave a comment saying thank you to someone you know (a real person, who you actually do know). But there’s more! We are publishing a meta-review of the Dex Smooth Soft Fountain Pen on United Inkdom on Monday 9th May. You can double your chances of winning by leaving a comment there (details will be in that review and I’ll update this to link to it when it goes live), too. You can only enter twice though: once here, once there. 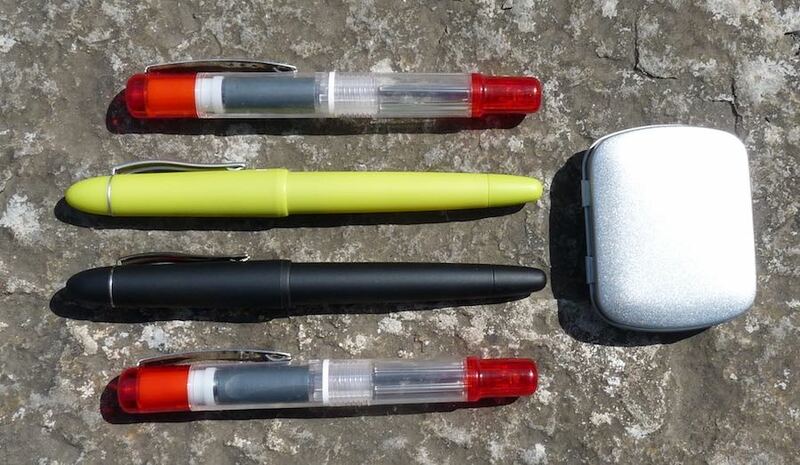 We have now published the meta-review of the Dex Smooth Soft Fountain Pen on United Inkdom. You can double your chances of winning by leaving a comment there, too. You can only enter twice though: once here, once there. The closing date is 9am BST on Sunday 15th May. The winner will be picked randomly and announced here. The giveaway is open internationally. thank you mum. I miss you. Thanks to my daughter for giving me so much love and laughts. Thank you Mother-dear. You have taught me how to be a lady and how to be a mother to my children. I love you big circles. Given the proximity of this giveaway to Mother’s Day, I suppose I must thank both my mother and my wife, for being such good mothers and raising good kids. I am interested in this contest because several of my co-workers are dipping their toes into the fountain pen rabbit-hole and seem to be on the cusp of diving deeper. These starter pens would be a great jump-start! Thank you to my auntie Sarndie whos love of stationery inspired my own. Parkinsons disease has taken away her ability to write so I will endevour to continue for her. This would be perfect for a friend I am trying to get in to pens! Thanks Craig, for helping me to feel confident in my creative pursuits. Thanks Lindsey for encouraging my stationery addiction! Thank you, Kay. My life has been so much better since I’ve known you! Thank you, Nena, for putting up with me after all this time. Thank you Pip for 40 years of wonderful marriage and two lovely children. Thanks for loving me through difficult times when I couldn’t walk. Thanks for being patient as I learned to walk again and for encouraging me to walk further and further. Now we can walk to the beach and watch the sunsets. Thank you to my wife, who is an amazing gift to my life. Not only is she a great mother to my girls, but she puts up with all my quirks, including my love of pens. Thank you to my brother for getting me a watch that means a lot to me and my family. A big thank you to my sister for being the person I can always talk to, no matter what the issue. Thank you to my high school English teachers, Mrs. Kuhns and Mrs. Wetterauer, for showing me the value of reading with intention and writing with thought. Thank you to my wife who has provided so much energy to my life. Thank you to my partner who makes my life a better place. Thank you to my parents for all of their support. Thanks to my parents for putting up with me! Thanks to my sister and mother for introducing me to the world of all things crafty and beautiful. Thank you to my wife for allowing me to start on my pen addiction and then joining me. I’d like to thank my friend José. He’s the kind of friend that goes above and beyond the call of duty when it comes to our small circle of friends. During the party two years especially, he has been my rock and I don’t know what I’d have done without him. Thank you, mom ! I love you to the moon and back ! Thanks to my twin sister for sticking with me even on my bad days and motivating me to study and listening to all of my rants! Thank you mom. Miss you. Thank you to everyone in my life that have been able to put up with me and my terrible personality, especially my parents for being able to stand me for this long. Thanks to my sister for teaching me how to drive. Thanks to my amazing daughter who can’t help producing amazing art! Thank you to my professor whose fountain pen inspired my love for fountain pens. And, aside from that, thank you for always listening and guiding me when I need help. Thanks to José, my boyfriend. There has been a really happy ride. Thank you, Mom. As much as you drive me crazy sometimes, you are have been there for me through my toughest times, and I’m grateful for that.